There is a photography game that DSLRs lose to cameras in phones. It is not surprising that more photographs being taken and shared today are on the multi-purpose phone than through a single purpose camera. And, some phones have better camera sensors and zooms than point and shoots. Personally, I have always found it fascinating that a particular view composes itself in the phone range a whole lot better than in a DSLR. This of course is because of the silo-ed functionalities of DSLR lenses which were developed with the explicit purpose of being master of one. And, they do that very well. Yet, there are times when you just want Jack. But, even without the restriction of focal length and range, there are certain subjects that inherently better suit a phone capture. Shooting people in places is one of those occasions. For one, it is unobtrusive. Second, it is way faster to whip out a phone to capture the moment than swing a heavy DSLR into position. And, third, the phone with its wide angle manages to captures a sense of movement and fluidity that eludes its masterful cousin. I want to talk about those photos in this post. There is a lot written about photography in general and more recently, iPhonography in particular (sorry Androiders; you have the better camera but nobody seems to bother!). Yet, a lot of this literature focuses on getting the shot and less to do with how to say different stories with the same photo. That is, post-processing. A well shot photograph, that is technically accurate needs no massaging and perhaps, that is why, little is spoken about this part of the process, even though everybody does some amount of it withe every photograph. Still, a photo in a regular camera typically needs less processing and takes less processing. The fascinating thing I find about photos taken on a phone is that they are amazing effects you can create with filters and some post-processing. Effects that help you tell a story. Different effects that tell a different story for the same photo. Even pixelation adds character. It is not that you can't do that with the higher resolutions ones on the camera. It is just that since the phone is considered much more amateurish, there is more opportunity to be frivolous and so much more fun. So, I am going to share some tips and tricks I have picked up playing with my photos. Again, I think this is best with a human element in the image to create emotive effect. It is almost as if you can tell the subject mood, life story, thoughts by what you choose to highlight in the image. Let me show you what I mean, and you can tell me what impresses you.... Fair? 1. Before and After shots: To highlight how to create an effect. The ideas can, of course, also be applied to traditional photographs as well as they are more concepts than rules. This effect is a throwback to the 70s and 80s when psychedelic was just being normal. It creates a great retro look and suit particularly dark shots that have slivers of colors in them or a genuinely retro place that the imagine did not fully capture the feel of. In the images below, the left is the original shot of a new restaurant, recreated on the Iranian cafes of Bombay that thrived at the turn of the last century into the 80s. So, there are a lot of retro finishes like the tiles at the bottom to the framed photo of yester year cine stars lining the walls. My original photo was patchy and unimpressive. By dialing by the contract and saturation, I could make a better statement and convey the feel of the place. A corollary application of increased color effects is to show warm emotions, like happiness, joy or quite simply warm fires and flavors. So, lets see how that applies in the below photos for contrast. 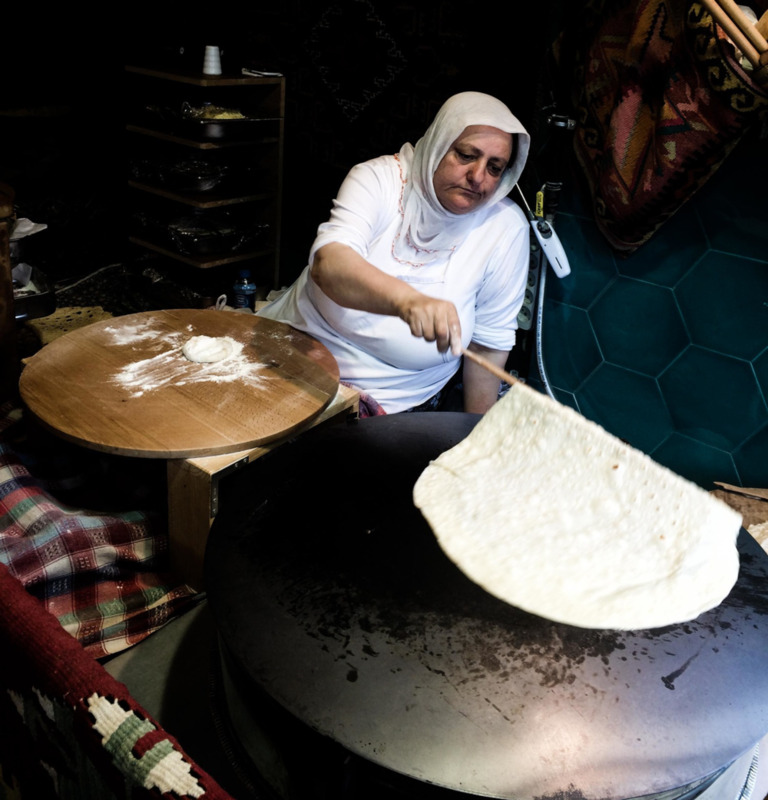 Both women here are in the middle of making the same dish, the Gozleme. The one on the left was shot at a non-touristy humble lunch place in Selcuk, Turkey. A few women sat around the fire, rolling out the dough, filling them and cooking them in the open wood fire you see, to serve to the diners. It was collaborative and they were rather chatty and seemed happy working away (and with me shooting them). You can see that energy in the lady's face. The bright colors simply enhance her cherubic outlook as much as the blazing fire shows that it is a warm place to be - physically and emotionally. In contrast, the one on the right was shot in Istanbul along one of the slightly less busy streets. She was by herself, sitting in a glass enclosure at the head of a restaurant, almost a show piece. Her loneliness, the hardship of trying to make ends meet in an expensive metropolis was etched on her face. Too used to being photographed (that was the purpose of the window after all), she showed no change in emotion when I captured this. To convey that, I chose to go with muted tones to send the message of depressed and repressed. I could also have used B&W, but, doing that lost some of the details of the image such as the downward curvature of the mouth showing resignation. One the most common uses of the B&W or Sepia filters is to show age. And, it is a good one. The above photo was taken in an old market in Akko, Israel that even today holds on to the antiquated importance of markets in the way of peoples' lives. This man has been making pomegranate and orange juices for so many years that time almost stands still. Sometimes, when I comes across such situations I wonder if the life of the subject also seems to be in a standstill of sorts. Ironically, in Israel, still would indeed be infinitely more appealing than what really is. Contrasted with the old juicing man, the above two shots show the same imagery to different effects. Here I use the B&W to convey another message, that of precision. Pourovers have become a science with accurate measurements of volume, temperature and water pressure. In comparison, the art of making pattern with foamed milk into espresso, is just that, Art. Art inherently is considered colorful. I have to agree that while the B&W image has a standing on its own, the one on the left becomes more alive and meaningful in juxtaposition with the right. Contrast is a great tool to use to highlight expressions on people's faces. As a basic tool of manipulating light, this is one of my favorites, especially, when processing on a phone where less is more. Tweaking the contrast lets you enhance not only the light-shadow effect but also the vibrance of objects in the light. Especially, in indoor shoots, with a lot of background noise, it can be a very helpful play. The image on the right was taken in a cafe where there was a lot of footfall, including in the table that was my focus. In particular I wanted to capture the expression of the lady with the blu scarf, who had been the most curious of my activities of the camera. Yet, in the brief instant that I took the photo, I was not aware of how interesting her expression would be. The moment I captured was one when the entire table was laughing about something, yet, she looked at me with the mirth of the table on her face as well as the knowing and amused curiosity of my feeble attempts to mask what I was doing - blatantly photographing the human element in the shop. I dialed up the contrast to block out her neighbor as well the background of the cafe, so as to highlight her face in sharp contrast. On the left, is a scene from a sugar shack near Montreal. I was being my usual single minded self in getting the photos just so and the styling exactly as I wanted. The guy was laughingly good natured about it all. As a overhead photo, I could not get much of his expression into it but by playing iwht the contrast I could emphasize the curve of the mouth through the puffed up cheeks and a shadow effect that conveys its mirror on the other side. At the same time, since it is a food photograph, the play on light also enhances the story on the plate, between the darker slow cooked meats and the light vibrance of the greens. To vignette or not? And, how much? Vignetteing is indeed an artistic touch. There are simple reasons to darken the corners - to cover up unwanted objects, light bounces, draw in the focus to the central subject. Then, there are the secondary level of awareness creation for using a vignetting brush. Shots taken during mid day, when the glare is the most or at dusk are perfect candidates for this effect, especially when the subject is clearly defined as in the photos below. The darkening of the edges blunts the blinding harshness of the sun, as in the case of the photo on the left. I wanted the sun but I also wanted the shimmer of the fish skin to come out. That was being bleached out by the sun. Vignetting helped to make a balanced case. On the right, is a photo shot at dusk with the light source being the halogen lamp in the cart. Vignetting simply enhances the ambience of dusk. It is a simple purpose, yet without that, the story is less compulsive. The yellowness of the cart's lamp would get lost without the contrast that the vignetting provides. The above photo is one of my favorite shots. It was taken on the Galata bridge in Istanbul that provides stunning opportunities for human study. By the time, I came to walk this bridge, I had learnt, by talking to people and smiley observing that life in the city was not easy (ref. lady making gozleme above). These men were fishing not for fun or their dinner but to sell the fish caught to the restaurants below the bridge catering to scores of tourists. They won't make much, because the fish are not big but that is they only source of income. Mind, the restaurants then resell the fish for exorbitant prices to visiting tourists, plates costing as much as they would in US or EU. The effect of B&W was to bring out the starkness of their plight. I added a layer of light vignetting to enhance the shadow effect of how small the river itself to the pressures on this man's life. Keeping him in the bright center added the same effect of having a spotlight shone on him, which, is really the case here as men are breadwinners of a Turkish family and the family's responsibilities must squarely be borne by him and the vagaries of fishing in urban waters. These two photos capture how you can get starkly different messaging with the same photo processed different ways. The former enhances the smile and warmth on a rather stern face, making it very paternal in outlook. While the latter, simply highlights the austereness. The back story here is that I was walking along one of the back alleys of Istanbul where tourists do not usually go (in an attempt to escape the clingy cries of vendors all over the city) and happened upon him. He is the tea-man, the person who brings hot tea to the shopkeepers in his beat several times a day and takes away the empty glasses. To find this strange non-Turk in his 'hood and one that requests him to pose was one of definite amusement for him and probably made for an anecdote over dinner and gossip. What do you think? Which one do you prefer? Now, I would love to hear what you thought of this post. Would like more such topics covered? What else would you like me to write about in photography?